Have you ever loved a vacation spot so much that you wish you could live there forever? Or yearned to have a heart-shaped jetted tub right in the bedroom like the one at that romantic lodge? Well, you’re not alone. It’s perfectly normal to want to recreate special experiences and memories in our day-to-day lives. That’s why it’s so important to be totally honest with yourself when you’re figuring out what kind of home and lifestyle you want when buying a house in Dahlonega. The cabin vibe at your last getaway might not be as enchanting if you lived in it every day. Once you’ve decided on buying a house in Dahlonega, you’ll need to narrow your search. First, you should know that Dahlonega, the county seat and the only incorporated city in Lumpkin County, also refers to the county as a whole. 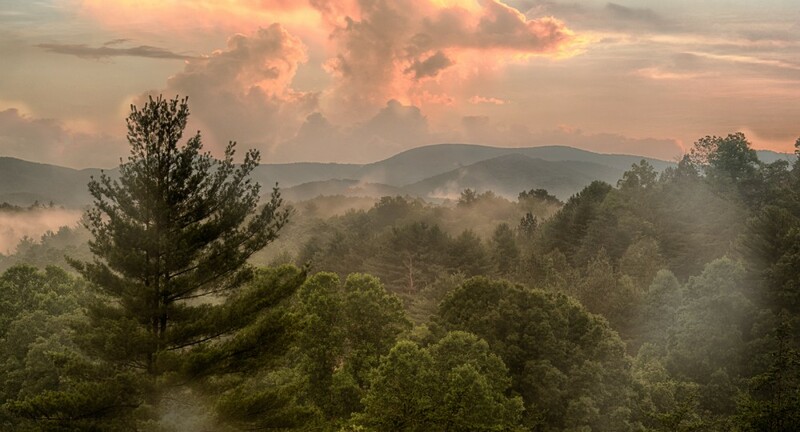 That being said, in Dahlonega there are almost 300 acres of land; a third is awe-inspiring, undeveloped National Forest land and the other two-thirds are either in the city or “out in the county.” Where can you see yourself buying a house in Dahlonega? Mountain views that’ll literally make you have to catch your breath. While you’re weighing the pros and cons of various home settings in Dahlonega, ask yourself about the kind of lifestyle you want to live, too. Maybe it’ll be the same lifestyle you had where you’re moving from. Then again, maybe it won’t. Whether it’s by choice or necessity, this could be just the right opportunity to make some changes in how you live and spend your time. Do any of these lifestyle changes strike a chord with you? Do you have young children (or grandchildren) to think about? Any dangerous features you couldn’t childproof? Could you relax in the house on the river or the one with the pool in the back with toddlers around? What about recreational activities for school-age children? Are there places nearby for them to play and meet other kids? Do you want to choose a home close to the kids’ schools? How would they get to school—bus or “parent pick-up?” And how long of a drive or bus ride would that be? Will you have aging parents living with you—now or in the years ahead? Choosing the right home now, in the right location with the right layout, will make that lifestyle change easier on everyone. Think about single-floor living—no stairs—and what features would be adaptable to allow for wheelchair accessibility or other mobility issues down the road, if needed. Of course, you’ll want to think about the distance—and time—to get to doctors, medical facilities and other services from your new home. And how about you? Any lifestyle changes in your life or your family members’ lives that might influence your decision when you’re buying a house in Dahlonega? Empty nest coming up? Retirements? Telecommuting opportunity. Starting up a new business? Will this be your primary residence or a second home? Don’t forget this one. Your satisfaction with the home and lifestyle you choose when buying a house in Dahlonega depends a lot on your personality and the personalities of your family members or others you’ll be sharing your dream home with. How well do you adapt to change? Would you be most comfortable in a home and community similar to the one you’re moving from? Or would you find it exciting to go a whole different direction? Do you imagine relaxing on the deck while watching the sun set? Or do you like being on the go all the time? Would you rather go shopping or bird watching? Hike the mountain trails or learn how to paint? Would you like to be in the middle of the action for local festivals or nestled into your hideaway far from the crowds? How about meeting people, making friends and getting involved in activities that are important to you? Do you want to be near a particular place of worship, a place with open mic nights or a place where you can work on your golf game? How’s your night vision? If you don’t see well enough to negotiate the curvy mountain roads after dark, consider living close to town, near restaurants, plays and concerts, so you can be part of the nightlife. It’s smart to think about these kinds of things—not to mention your budget, a whole different story —when buying a house in Dahlonega. The more you’ve thought about them and can share them with your agent or broker, the better we can help you find the home and lifestyle you’re really looking for.